Cristiano Ronaldo streaks down the left side of the pitch, and midfielder James Rodriguez lofts a perfect through ball over the head of the helpless defender. Ronaldo one times the ball into the back of the net – yet another amazing goal for the Real Madrid superstar. Perhaps you’re one of the billion or more football/soccer fans here in Columbus or around the world who’ve seen one of Ronaldo’s numerous La Liga or World Cup goals on television. 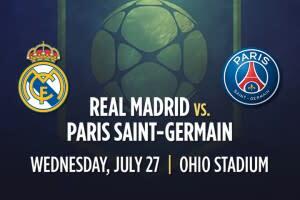 And now, you can see Ronaldo, Rodriguez, teammate Gareth Bale and several more of the game’s top players, as Real Madrid (Spain) and Paris Saint-German (France) play one another on July 27 at Ohio Stadium as part of the 2016 International Champions Cup organized by Relevant Sports. The 10-team lineup for the International Champions Cup also includes: Liverpool, Chelsea and Leicester City from England; AC Milan and FC Internazionale from Italy; Barcelona from Spain; Bayern Munich from Germany; Celtic FC from Scotland. These teams feature 50 of the world’s top 100 players. Here’s the complete schedule. Tickets can be purchased here starting on April 5 with all the games will be broadcast on the ESPN family of channels. “All across the globe, all eyes will be tuned into Columbus on that night,” said Andy Loughnane, President of Business Operations of the Columbus Crew SC. “This will put the city in a more favorable position to grow the sport” on the youth, college and professional levels. A crowd of 100,000 or more could fill the Shoe, which will get a temporary grass field for the big game. The U.S. record for attendance at a soccer game is 109,318, which was set on August 2, 2014 when Real Madrid and Ronaldo took on Manchester United in an International Champions Cup game at Michigan Stadium. The Shoe is a fitting place for this world-class match and it will be the first international soccer match to ever take place at Ohio Stadium. The iconic venue was also the first home of the Columbus Crew SC and 31,550 fans attended the Sept. 15, 1996 game against New York. This is still the team’s all-time attendance record. “The success that the club was able to generate at the Shoe spawned the growth of the team (and led to the building of MAPFRE Stadium, the first soccer-specific stadium in the country),” Loughnane said. And the building of the new stadium, “was the catalyst for soccer in the United States,” he added. Mapfre has become one of the most important soccer venues in this country, a home field of sorts for the Men’s World Cup Team. The team plays here on a regular basis and has never lost a game in Columbus (7-0-3). The current team – featuring star forwards Clint Dempsey and Jozy Altidore – will play Guatemala in an important World Cup qualifying match on March 29 at Mapfre. Tickets are still available with a sell-out crowd of flag-waving, song-singing and ultra-enthusiastic fans expected. This is the fourth edition of the International Champions Cup, an event that is gaining status in the international football world. Paris Saint-Germain is the defending champion, and the team has also won three consecutive French Ligue 1 titles. They are led by Thiago Silva, who is also a member of Brazil’s national team and forward Zlatan Ibrahimovic, a prolific goal scorer and a member of Sweden’s national team. Real Madrid & Paris Saint-Germain: Exclusive presale tickets for the matchup will be available on March 29 at 10 a.m., while the general public will have access to tickets on April 5 from ticketmaster.com, Ticketmaster outlets, by calling (800) 745-3000 or at the Schottenstein Center Box Office from 8 a.m. to 5 p.m. Monday through Friday. Fans can sign up at www.internationalchampionscup.com for access to the presale. All venue-specific and other ticket information is available at www.internationalchampionscup.com. USA and Guatemala: Tickets can be purchased through ussoccer.com, by phone at 1-800-745-3000 and at all Ticketmaster ticket centers throughout Central Ohio (including many Kroger stores), as well as the Mapfre Stadium ticket office (open Monday-Friday 9 a.m. to 5 p.m.). Purchases are limited to eight tickets per household. Ultimate Fan Tickets (special VIP packages that include a premium ticket, a custom-made official U.S. National Team jersey with name and number, VIP access to the field before and after the game, and other unique benefits) are also available exclusively through ussoccer.com.